"Site-specific theater in a boxing ring, now that’s cool! 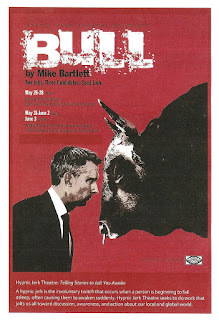 Brand new #tctheater company Hypnic Jerk debuts with BULL. 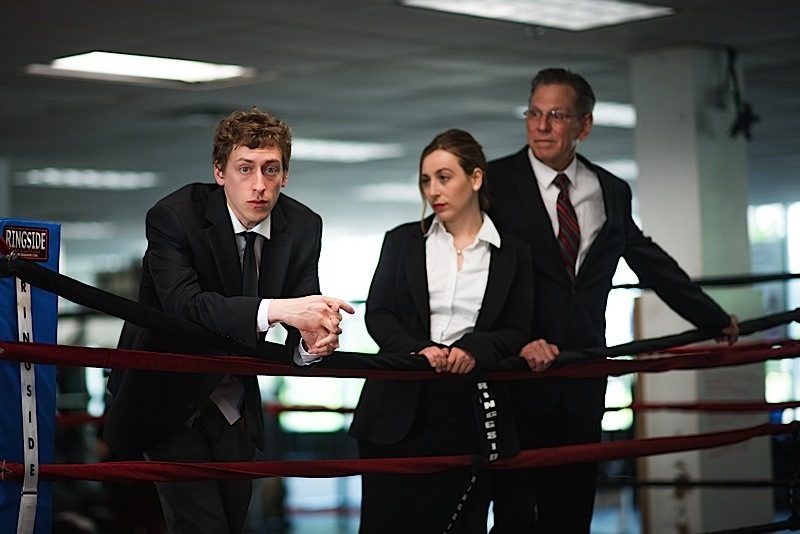 Note: the play is not about boxing it’s about office politics. And a great metaphor it is. Director and Hypnic Jerk Theatre founder Kari Steinbach notes in the program that playwright Mike Bartlett was inspired to write Bull after watching a bullfight, but a boxing match works well too. They're staging the show in two locations on two weekends only, the first in Element Boxing Gym in St. Paul, the second at A Mill Artist Lofts in Minneapolis. I like the idea of a traveling show, making it more accessible to different communities (and people who are loathe to cross the river), but I'm glad I saw it in the first location, because it was really cool to watch a play in an actual boxing ring in an actual gym, something I've not done before. Just two more performances remain this Memorial Day Weekend, before the show moves across the river next weekend. Check it out for a short, intense, engaging, well directed and acted performance. Bull takes place during a job interview of sorts. Three employees are meeting with their boss, who will decide which one of them to fire. They all show up in their (questionable) best black suit with white shirt and a touch of red (smart styling). And then two of them proceed to gang up on the third to undermine his confidence, then outright tell their boss he should fire him. They mercilessly bully him in a way that's difficult to watch; your heart just breaks for this poor guy who doesn't deserve this treatment, he just happens to be in the way of their career advancement. Then the whole thing is over, and this exploration of "cruelty as a form of entertainment" leaves one thinking how mean we can be to each other, in person like this, or more commonly, online. But why are we so mean? Bull doesn't answer that question, it just shows us this ugly part of humanity. Bull employs a trio of talented young actors who've been making the rounds on smaller stages around town, and it's great fun to watch them spar. It's clear who's who from the moment of their entrance; David Wasserman's Thomas trips clumsily through the ropes around the ring, frantically trying to fix his hair and suit, while Ben Shaw's Tony gracefully leaps over the ropes without a hair out of place. Lauren Diesch plays Isobel as cool and in control, clearly siding with Tony against the hapless Thomas. The fourth member of the cast, Rod Kleiss, makes a brief appearance as the jerk of a boss. Thomas is the only empathetic character in the bunch, but all are interesting to watch.